All models of the M939 share a common basic chassis, cab, and hood/fenders. The basic truck is a 6×6 (three axles, six wheels, all of which are powered) medium truck. Early M939s were rebuilds of M809 vehicle chassis by AM General, with a new automatic transmission, cab, and hood/fender. Suffix –A2 are new production by Bowen-McLaughlin-York/BMY with later model Cummins engine. The vehicles have a wide variety of configurations and weights. Note that the motor and tire specifications, along with other improvements, apply to the A2 versions (and A1 versions) of each base model listed below. There is an M928, an M928A1, and M928A2. The M939 and M939A1 models use a Cummins NHC 250, a 855 cu in (14.0 L) naturally aspirated inline 6 cylinder diesel engine developing 240 hp (180 kW) at 2100 rpm and 685 lbf⋅ft (929 N⋅m) of torque at 1,500 rpm. This was the standard engine of the M809 series. The M939A2 models use a newer and smaller Cummins 6CTA8.3 504 cu in (8.3 L) turbocharged inline 6 cylinder diesel engine developing 240 hp (180 kW) at 2100 rpm and 745 lbf⋅ft (1,010 N⋅m) torque at 1,500 rpm. All models have an Allison 5 speed automatic transmission with a two speed transfer case. The front axle was engaged in low range. The M939 uses 11:00 R20 tires with two tires per side per axle in the rear (rear tandem duals). The M939A1 and M939A2 series use oversized 14:00 R20 tires and rear tandem "Super Singles". 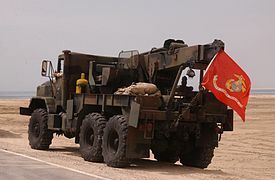 M939A2 series vehicles use a central tire inflation system (CTIS). There are three wheelbases (measurements are from the centerline of the front axle to the centerline of the rear tandem). The short, used for tractors and dumps, is 13 feet 11 inches (4.24 m), the long ("standard"), used for cargo and wreckers, is 14 feet 11 inches (4.55 m), and the extra long, used for long cargo and expansible vans, is 17 feet 11 inches (5.46 m). The M924 (M926 w/winch) was the standard cargo version of the series. It had a 7 ft × 14 ft (2.1 m × 4.3 m) low sided box with a bottom hinged tailgate. Side racks, troop seats, and overhead bows with a canvas cover were standard. The M923 (M925 w/winch) had a body with drop sides so it could be loaded from the side by forklifts. The M927 (M928 w/winch), with an extra long wheelbase, had a 20 ft (6.1 m) long box. There was no drop side version. The M929 (M930 w/winch) was a dump truck used to haul sand, gravel, dirt, rubble, scrap, and other bulk materials. It had a dump body with cab protector and a tailgate that could hinge at either the top or bottom. They could be equipped with overhead bows, tarpaulin, and troop seats, but the relatively small size of the body limited their passenger or cargo load. The M931 (M932 w/winch) was a semi-tractor used to tow semi-trailers up to 37,500 lb (17,000 kg). A front-mounted winch was optional. The M936 was a wrecker used to recover disabled or stuck trucks and lift large components. A rotating, telescoping, and elevating hydraulic boom could lift a maximum of 20,000 lb (9,100 kg). Although the truck was not meant to carry a load, the boom could support 7,000 lb (3,200 kg) when towing. They had 20,000 lb (9,100 kg) front and 45,000 lb (20,000 kg) rear winches, outriggers, boom braces, chocks, block and tackle, oxygen-acetylene torches, and other automotive tools. The M939 to M945 were chassis with cabs, meant to carry specialized bodies. They were available in long and extra long wheelbases, and with or without front winches. The safety of the M939 series of trucks has been criticized, especially braking performance and stability when loaded. In 1999 the U.S. Army began retrofitting anti-lock brake systems to the M939 trucks. Until the trucks were modified, they were limited to a 40 mph (65 km/h) top speed by an Army-wide safety order. Prior to that improvement, 26% of all Army vehicle accidents and 53% of all Army vehicle accident fatalities were in M939 series trucks. From 1987 to 1998 the series made up 9% of the total U.S. Army vehicle inventory, but accounted for 34% of all fatal accidents. The problem seemed to be that the torque converter would "lock up" in 2nd gear, and would not unlock easily. When the driver attempted to brake hard, often in a sudden or 'panic' stop, and accidentally locked the brakes (no wheel movement, tires skidding), this would kill the engine; this also killed the power steering, and the driver would suddenly be unable to steer. Too often, the truck would veer sideways and either hit something or roll over. ^ a b c d e f g h Doyle, David (2003). Standard catalog of U.S. Military Vehicles. Krause Publications. pp. 202–203, 205. ISBN 0-87349-508-X. ^ a b c d e f g h "TM 9-2320-272-10 Operator's manual for Truck 5 ton, 6X6, M939 series". US Depts. of the Army and the Air Force. 25 Jul 1984. Retrieved 3 Sep 2015. ^ "Annex C Appendix II". US Army Technical Manual of Foreign Military Sales: Battlefield Damage Assessment and Repair (PDF). Washington, D.C. 18 December 1987. p. 263 (C-3). TM 9-2320-356-BD. ^ "Military Safety: Army M939 5-Ton Truck Accident History and Planned Modifications". GlobalSecurity.org. US General Accounting Office. 4 Sep 1999. Retrieved 23 May 2014. 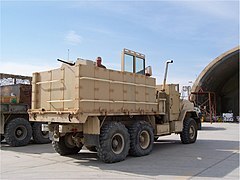 Wikimedia Commons has media related to M939 5-ton truck series. Dodge WC-1 to WC-43 "Beep"
Dodge WC-51 to WC-61 "Beep"
Caterpillar M520 and M877 "Goer"
This page was last edited on 15 April 2019, at 21:59 (UTC).